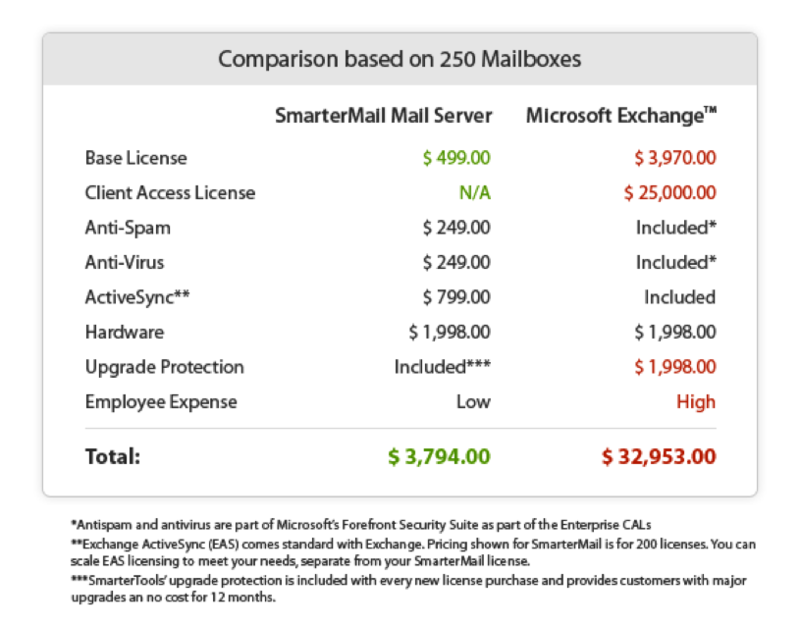 This document provides a comparison of SmarterTools’ SmarterMail Enterprise mail server software and Microsoft’s Exchange 2010 Enterprise mail server. It is designed specifically for server and system administrators and provides information on the hardware, software and licensing requirements of both products, with an overall cost breakdown in each category. It is equally important to review the end user experience for both products as well. Therefore, please review the white paper SmarterMail and Microsoft Exchange 2010: An End User Comparison for a more complete feature-by-feature comparison of both products from the end user’s point of view. Up to 250 mailboxes populating the mail server. This is simply a user limit for the sake of comparison and in no way infers a maximum user limitation, either within Exchange or SmarterMail. Accommodations for organizations wanting both webmail access as well as organizations wanting a mixture of webmail and standard desktop email clients. Mobility using multiple “smart phones” (e.g., Apple iPhone, Samsung Galaxy SIII / Note 2, LG Optimus 9, Nokia N-900) and other mobile devices (e.g., Apple iPad, Android tablets). At first glance, comparing a mail solution against the historical significance of Microsoft’s Exchange Server may seem like a rather daunting task. After all, a study in 2008 estimated that a full 65% of workers worldwide were using Microsoft’s email server. However, at that time there was a lack of competitive products that offered comparable functionality. That is no longer the case, and once you start peeling layer upon layer of complexity away from the Exchange infrastructure, vulnerabilities begin to appear. This is especially true when you look at Exchange from an administrative standpoint. Licensing — All of the software required comes with a cost—and that can be high on the list of priorities when planning out a new system or even a migration/change of an existing system. SmarterMail has a much smaller footprint and lower cost of entry and, as you’ll see, a lower long-term cost as well. Requirements and planning — There are hardware and software considerations when planning to build out an email and messaging platform. Exchange is well known for its complexity and difficult planning and installation requirements. SmarterMail offers a simpler set of requirements and nothing more than basic server administration and implementation skills are necessary. Management and Maintenance — Once the mail server is installed, someone needs to be able to monitor the day-to-day activity and health of the server, users need to be added or removed, settings need adjusted, and more. Being able to perform these tasks quickly, easily and from anywhere is extremely important. SmarterMail provides a simple and understandable set of management and maintenance tools built into an “access anywhere, at any time” web-based interface. Backups/Restores — Storage and recovery capabilities of online communications is hugely important. What options are there and what are the costs? SmarterMail can be backed up and restored using standard backup and recovery technology. No further investment in specialized hardware or software is needed. From a licensing perspective, a clear and concise licensing structure makes it much easier to plan out both an initial installation as well as any migration. Taking this into account, is it better to require an all-in-one licensing model or one that requires virtually each individual piece to have its own licensing requirement? First, let’s look at simple server licensing costs. This is licensing solely for the mail server software that is installed. Remember, for the purposes of this comparison we are going to look at a business that requires up to 250 mailboxes. Exchange 2010 — Enterprise is $3,970.00. SmarterMail — Enterprise licensing for 250 mailboxes is $499.00. A CAL is simply what the name implies: it’s a license required for a client—whether that is a user or a device—to access a server. Exchange 2010 — Requires user or device CALs, depending on how or what is connecting to the Exchange server. A user CAL is generally defined as a license for the person connecting, regardless of whether they connect via Microsoft Outlook, webmail or mobile device. User CALs are approximately $42.00 each. A device CAL is defined as a license for each device that is connecting (e.g., desktop, mobile device, etc.). Device CALs are approximately $68.00 each. SmarterMail — Does NOT require individual licensing for each person or device that accesses a mailbox. In fact, you can buy a license that will accommodate the number of mailboxes you need—plus give you some room for growth. Whether you need 250 mailboxes, 500 mailboxes, 1,000 mailboxes or even an unlimited number, there is a licensing model to fit your need (SmarterTools even offers a fully-functional Enterprise license for 10 mailboxes as a free trial). Employee expenses are somewhat subjective. With Exchange you have a very complex infrastructure, requiring multiple server roles, high-end hardware and software, and extensive project planning and management. On the other hand, SmarterMail offers a much simpler installation requirement and footprint. On these merits alone, the employee expense incurred with just the installation of Exchange—not to mention the day-to-day management and maintenance of it—logically dictates that a very experienced and well-trained individual or group is required. This, in turn, equates to a higher cost. With SmarterMail, an existing employee with a good grasp of server technologies and management skills is all that is required. That’s how SmarterMail was built: with ease of use and ease of management in mind. Rather than looking at the overall feature set of both products, let’s take a close look at the requirements of both Exchange 2010 and SmarterMail. Exchange 2010 — Requires 64-bit architecture. While not an issue at first glance, this restriction may require separate servers for each server role in the Exchange setup. This can be problematic for businesses wanting to use existing legacy hardware or that lack capital to invest in new hardware. Also, Exchange requires several server roles, managing various parts of the platform. This could mean the need for multiple servers. SmarterMail — Has a very acceptable minimum set of hardware requirements. This means businesses can run on either 32-bit or 64-bit hardware. As there are no server roles to configure, a single server may be all that is required. In fact, SmarterMail can run on an existing server in a dual-use role. That is, SmarterMail can run on a Web server or file server and doesn’t require its own hardware to run. Exchange 2010 — There is, of course, mail server licensing (either Standard or Enterprise) to consider. Additionally, Exchange requires Client Access Licenses (CALs) for each mailbox/user and in order to get security and antivirus, Enterprise CALs are required - at a substantially higher cost. And all needs to run within an active directory tree. Finally, Exchange 2010 must be run on a 64-bit version of Windows Server 2008. SmarterMail — A simple purchase of the mail server is all that is required. Antivirus and antispam are included with SmarterMail Enterprise, but there are options to increase coverage with Message Sniffer and Cyren. In addition, SmarterMail does NOT require a 64-bit version of Windows Server, making it incredibly easy to set up on an existing 32-bit or 64-bit server. Exchange 2010 — As mentioned, Exchange has multiple different server roles (edge transport, hub transport, mailbox, client, etc.) running within an active directory tree. As noted earlier, each role may require separate servers. That means extensive planning is required, from active directory on up to actual Exchange server installation. SmarterMail — Considering hardware and software requirements, one server can act as the mail server and also run any necessary antispam and antivirus add-ons. Furthermore, SmarterMail also does not require active directory, although it can integrate into an active directory tree so single-authentication can be used throughout an existing infrastructure. It should be noted, however, that the lack of an active directory requirement may reduce the time needed to plan out an implementation and installation strategy. With any software implementation, system and server administrators are challenged with keeping tabs on the mail server(s) hardware and software. Furthermore, there are day-to-day tasks, things like user management, domain management, management of blacklists and content filters, and much more. Exchange 2010 — As Exchange runs on a server OS, the majority of management and maintenance of the server has to be performed on the server. That means administrators generally have to remote or console into the server. In addition, management occurs via an Exchange tool that plugs into the Microsoft Management Console (MMC). If an administrator is offsite, these connections must occur through secured VPN. All of this can decrease the connection speed and therefore increase the time it takes to complete even routine maintenance tasks. Besides, it’s a somewhat convoluted and complex setup. SmarterMail — SmarterMail offers a powerful and extremely accessible web-based administrative front end. With the ability to set up different roles (e.g., system administrators vs. domain administrators), plus the ability to set up multiple, different system administrator accounts (so no one has to share logins, which results in better tracking and change management) SmarterMail administration is fast, is easy, and it can be accomplished on-site or remotely using any standard browser. SSL connections are available, and you can even limit access to the admin area by specific IP, further enhancing security. And unlike the Exchange plug-in for the MMC, SmarterMail’s administrators have access to numerous reports, from incoming/outgoing spam to server health, disk space usage to abuse detection. Exchange 2010 — When looking at everything that goes into planning an Exchange installation, there’s no doubt the people planning and carrying out the installation are professionals. This, in turn, means they significantly factor into the costs associated with that installation. In addition, there are possibly increase employee costs for the level of individual necessary to manage and maintain an Exchange infrastructure. Most system and server administrators for Exchange have years of experience and untold hours of training and product-specific education under their belts. Therefore, they won’t come cheap. SmarterMail — SmarterMail runs in a very simple, very easy to manage and maintain environment that is not unlike any base server installation. Therefore, a company can get by with existing staff and existing system and server administrators. The learning curve is much easier to manage with SmarterMail as standard server administration knowledge is about all that is required. Your data is only as good as its most recent available backup. And even then, a backup isn’t of any use unless it is recoverable and restorable. However, backups and restoration of data do not have to be complex and expensive initiatives. Exchange 2010 — Exchange can be backed up with most existing backup technologies. However, its one big exemption is that Exchange requires a separate and specialized backup agent in order to be able to back up mail files. Anyone who has priced these agents out knows this an expense to them, and in many cases the expense can be substantial. SmarterMail — SmarterMail can be backed up with any existing backup technology and does NOT require the use of a separate, specialized agent. This reduces the costs of backup and restoration and also is one less thing for administrators to manage and maintain on the mail server. The planning necessary for an implementation of Exchange 2010 is far more detailed and involved than what is necessary for an installation of SmarterMail. With Exchange, you don’t simply set up a Web server and a database. Things like active directory trees need to be considered, plus the necessity of various server roles—how to configure each role, figuring out what can you combine into a single server, planning how to configure the server connections and interactions, etc. Complexity is Exchange’s strong point; simplicity and ease-of-use are SmarterMail’s. Licensing is generally a sore spot with most software implementations. However, it’s extremely apparent that you get just as much with SmarterMail as Exchange, but with substantially less payout. Looking at the comparison tables alone demonstrates a 5X to 11X savings with SmarterMail over Exchange. Requirements, both from a hardware and software standpoint, again point to SmarterMail being a much wiser investment than Exchange. Minimal server OS concerns, no active directory (unless you need it), and much more flexible hardware options all place SmarterMail above Exchange. When looking at maintenance and management, plus the learning curve required, SmarterMail again gets the nod. Without the need for lengthy training or education, and simple server administration experience all that is required, SmarterMail is easily administrated by existing employees, again saving time and money. There’s no doubt Microsoft has the name. They’ve been around a long time, and have a long history of building quality software and being on the leading edge of technology, especially when it comes to providing a robust and feature-rich email solution. However, becoming one of the largest, if not THE largest, software and services company doesn’t come without some sacrifice. These sacrifices tend towards offering reliable, accessible access to support and customer service, at least affordable access to these critical needs.